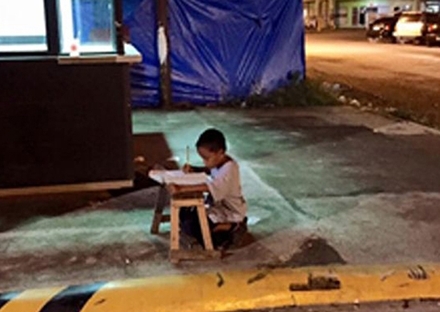 An image of a homeless boy who used light from a McDonald’s restaurant in the Philippines to do his homework has gone viral on social media with many saying he had them. Daniel Cabrera was by Joyce Torrefranca, a medical student, as he worked away on the pavement in Manilla. I got inspired by a kid ? The picture was soon being shared thousands of times, with people reflecting how often even basic living standards are taken for granted. Daniel’s home was burnt down and his father died. He is often seen begging with his mother in the same area, but shows a determination to get an education. No chair, no table, no problem--Daniel Cabrera is determined to study. "As a student, it gave me an inspiration to work harder. I'm fortunate my parents were able to send me to school. I seldom go to coffee shops to study, but this kid just hit me,” Torrefranca told Rappler.